We got back from New Jersey today, to a house that was 29° warm. Apparently our boiler had stopped working sometime while we were gone, as the water level dropped too low and initiated the auto cutoff. As the temperature dropped a radiator cracked in the kitchen. We’re currently working on getting the house back up to temperature—47° as I write this—and not having any pipes burst as things thaw out. At least we’ve proof that our snowblower works. Sigh. I wish I had known how complicated and troublesome steam heat was before we got into this mess. Continuing to catch up from my posting vacation, here comes the photo flood. This is the art batch. Esta and I went walking in downtown Asheville on the morning of the 22nd. I was looking for textures. I think I found a few. I also found a mystery. 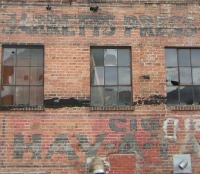 The faded lettering in the picture to the right says “Jarrett’s Press” (the full logo says “Jarrett’s Press Printing”). It’s on the back of a warehouse-like building behind the First Presbyterian Church in Asheville, just off Patton Avenue. Googling tells me a few things, namely that the press was active in the late 1920s, but not much else—and particularly not whether a close family member ran the press. It would be a little too ironic if one of my ancestors was in the printing business. We formed GoMainStream because the corporate plunderers have hijacked our public lands and the public process. And we formed GoMainStream because they’ve hijacked our language. They call polluting the air “Clear Skies” — and they call it “development” and “access” when they lock Americans out of the public lands that we hike, hunt, fish and love. We’re going to change that. And we’re going to change it by building a new coalition from the bottom-up — an organization that helps Americans take action and that works to reframe the debate about the future of our country. We’re going to do it by connecting hunters fighting to maintain access to elk habitat with suburbanites combating urban sprawl. Because conservation is not an issue of right or left, or urban versus rural, or red versus blue. It’s an issue of who we are as Americans. I think that this sort of action is an important first step in reversing the tide of Newspeak that continues to impede progressive efforts in the US—note the careful use of “conservation” rather than “environmentalism” and the nod toward the Bush administration’s successful avoidance of broad public outrage through careful language use. In fact, the only thing I can think of that I would change in the message is some of Gross’s language regarding “corporate plunderers.” He’s emailing to his base, but we learned in 2004 that if you stir up your base using inflammatory language, they’re not the only ones who end up getting mad. As commenters on my site have noted over and over again, the same fighting words that put a fire in the belly of liberals tend to make potentially sympathetic but conservative-leaning undecideds hot under the collar.